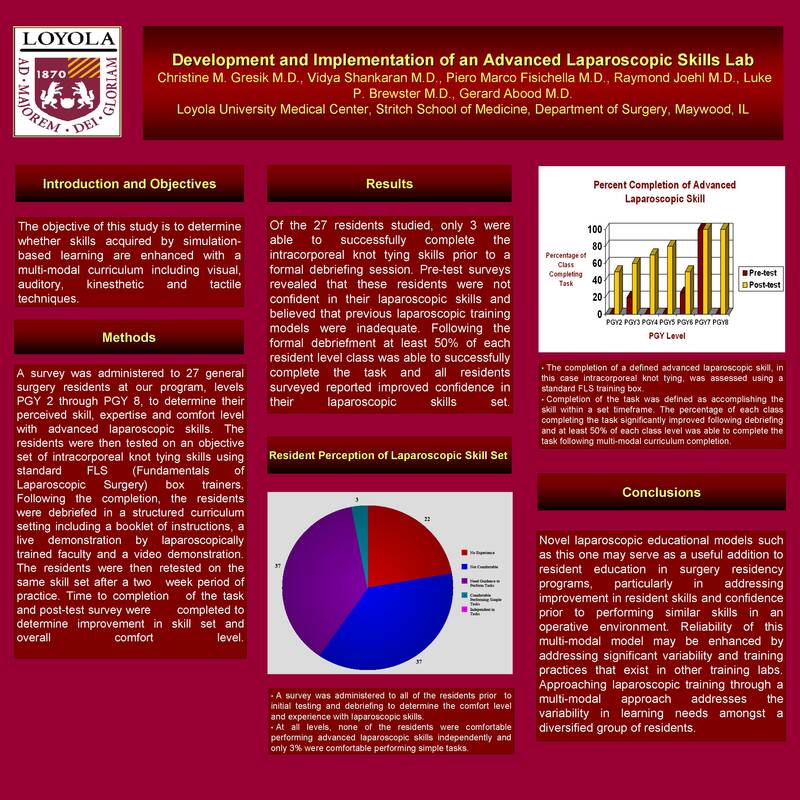 Loyola University, Stritch School of Medicine, Department of Surgery. Maywood, IL. INTRODUCTION: The objective of this study is to determine whether skills acquired by simulation-based learning are enhanced with multi-modal curriculum including visual, auditory and kinesthetic and tactile techniques. METHODS: A survey was administered to 27 general surgery residents at our program, levels PGY2 through PGY8, to determine their perceived skill, expertise and comfort level with advanced laparoscopic skills. The residents were then tested on an objective set of intracorporeal knot tying skills using box trainers. Following the completion, the residents were debriefed in a structured curriculum setting including booklet of instructions, a live demonstration by laparoscopically trained faculty and a video demonstration. The residents were then retested on the same skill set. Time to completion of the task and post-test survey were completed. RESULTS: Of the 27 residents studied, only 3 were able to successfully complete the intracorporeal knot tying skills prior to a formal debriefing session. Pre-test surveys revealed that these residents were not confident in their laparoscopic skills and believed that previous laparoscopic training models were inadequate. Following the formal debriefment at least 50% of each resident level class was able to successfully complete the task and all residents surveyed reported improved confidence in their laparoscopic skills set. CONCLUSIONS: Novel laparoscopic educational models such as this one may serve as a useful addition to resident education in surgery residency programs, particularly in addressing improvement in resident skills and confidence prior to performing similar skills in an operative environment. Reliability of this multi-modal model may be enhanced by addressing significant variability and training practices that exist in other training labs. Approaching laparoscopic training through a multi-modal approach addresses the variability in learning needs amongst a diversified group of residents.